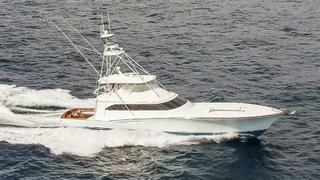 The 26.5 metre sportfish motor yacht Mantra, listed for sale by James MacGregor at MacGregor Yachts, has been sold with the buyer introduced by Michael Gardella at Crow’s Nest Yachts. Built from cold-moulded wood by US yard Weaver Boat Works to a design by Donald L Blount,Mantra was delivered in 2013. Accommodation is for up to 14 guests in a full-beam master suite, VIP suite and two cabins with four bunks in each, all with entertainment centres, television screens and full en suite facilities. The main saloon is panelled in teak and has an L-shaped settee to starboard facing the electric panel to port and an entertainment centre including a 50-inch Samsung plasma television screen and a Bose stereo surround sound system. Forward is the galley area with an island centre and four bar stools, while to starboard is an L-shaped dinette area for casual snacks through the day. Forward of the galley area is the extensive tackle room featuring custom rod and reel storage, a large stainless-steel drawer for tools and tackle, along with counter space to work. The fishing cockpit comes with large refrigeration and freezer compartments, including an enormous refrigerated fish box. Other equipment includes a Release Marine fighting chair, rod holders and tackle drawers. The bridge area has two helm chairs and comfortable seating for up to 12 guests able to enjoy al fresco cocktails utilising a custom stainless-steel freezer and drinks box. Her top speed is 43 knots and her power is courtesy of two 2,600hp MTU 16V2000M94 diesel engines.